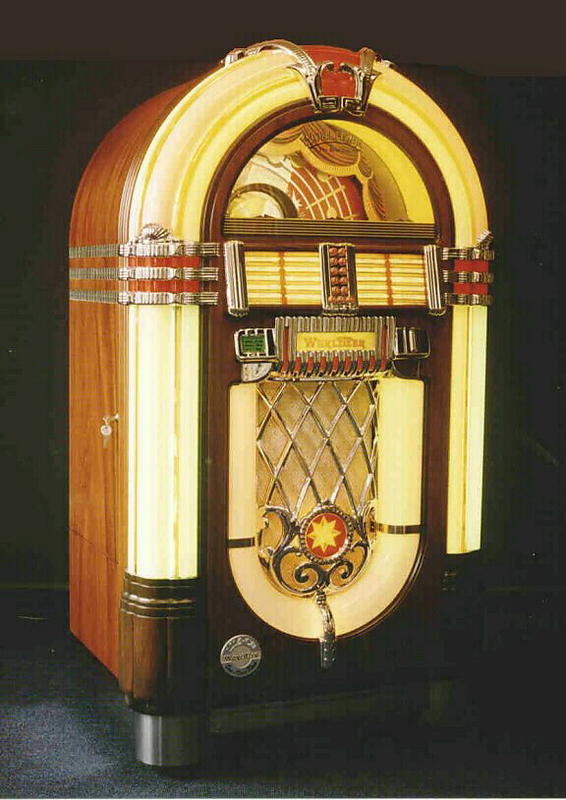 Secondhand Wurlitzer One More Time CD jukebox in walnut finish. Made by Deutsche-Wurlitzer in Germany. A superb looking machine and a great talking point. This jukebox holds 100 CDs and can be set to album play and random play, coins or freeplay. Superb sound system. Remote control capability and hand set included with some machines. Fully serviced. I have 3 of these Wurlitzer machines in just now. One is without remote control system £5250. One is with remote control system. £5750. The other machine is a 100 Cd walnut machine with remote control and the more powerful F91 amplifier. £6000. Hand crafted finish, 8 colour dancing bubble tubes and rotating changing colour cylinders with a fully visible playing mechanism.